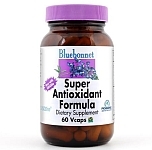 Bluebonnet’s Super Antioxidant® Formula Vcaps is specially formulated with a full range of potent antioxidants, including GliSODin® (10 mg) the first vegetarian form of SOD from cantaloupe melon, CoQ10 (30 mg) in the form of ubiquinone, Pycnogenol® (50 mg), red wine polyphenols (50 mg) and N-acetyl-cysteine (250 mg) in easy-to-swallow vegetable capsules for maximum assimilation and absorption. Other Ingredients: 100% Kosher vegetable capsules, vegetable cellulose, silica, wheat maltodextrin, vegetable magnesium stearate. Free Of: milk, egg, fish, crustacean shellfish, tree nuts, peanuts, barley, rice, sodium and sugar.